Rich Jacobs is a visual artist, curator, musician, and skate archivist who learned everything he knows by dodging Big Gulps as a young punk in Colorado. On 40th and Webster Streets in Oakland, the respective facades of 1-2-3-4 Go! Records and Subrosa cafe feature scratchy, frenetic paintjobs in stark black-and-white swirls and cool blue splotches. Behind a few closet-size storefronts on the same block hides Rich Jacobs' closet-size art studio. He painted the businesses outside in a style that's recognizable in the work tacked to the walls of his workspace. Sitting at a tiny desk, Jacobs was engulfed by text and illustrations rendered with the same unstable and jagged lines. Remnants included yellowing handwritten notes, recent show flyers, skate decks baring his work, and photographs of punk bands on stage. Jacobs told the stories behind things he had made and the things he had collected with equal vigor. 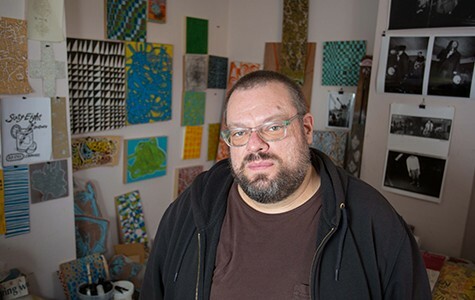 He pointed out a painting by Tim Kerr, best known as a member of the seminal Texas punk band Big Boys, who has become a frequent collaborator. Kerr is part of a group show Jacobs curated at Seeing Things gallery in San Jose that opens on Saturday, December 13, and the duo are slated to perform together at Stranded in Oakland on Sunday. The two share an interest in creative processes that embraces error and spontaneity. They've shown visual art together in Brazil and Japan, and are preparing to release an album of improvised guitar suites — Jacobs provided an advance copy of it on CD-R, encased in vivid crayon artwork. He described it as soundtrack music, except the duo is looking to reverse the usual order of film score commissioning: They're in talks to make a movie to complement the recordings. In Jacobs' practice, skateboarding, street art, self-publishing, and punk are inseparable. It's not an uncommon alignment, because those activities share a fundamental similarity. Whether they entail repurposing the city's concrete contours, blank building exteriors, or underutilized basements, each rejects the intended use of space in favor of something more inventive. Throughout his career — a lifetime of making, fusing, and archiving subcultural works — Jacobs has also overcome the shared problem of such practices: Repetition exhausts their initial thrill; basement shows are still cool, but there's nothing especially clever or novel about the idea anymore. Jacobs' creative enterprise involves letting skateboarding and punk color his artwork, but he's keen to avoid their rote trappings. Jacobs, who is 42, discovered skateboarding through his older brother while growing up in Long Beach. At that time, skateboarding was a nascent wheeled offshoot of beach culture on the blighted strips of West Los Angeles' waterfront. Jacobs said he was on a skate deck as soon as he could walk. "It was way more fun riding a skateboard down a ramp than a Big Wheel down the sidewalk," he recalled. Likewise, skateboarding went hand-in-hand with early punk. "It was funny, fast, obnoxious, and my parents were bummed on it," he said of punk's initial appeal. "It was a teenage rebellion, but I was a little kid." Jacobs' father was a pilot, so the family moved frequently, first from Long Beach to Seattle, where Jacobs attended his first punk show, featuring 7 Seconds, at age eleven — and then to Denver, where he went to high school and helped foster the local punk scene, discovering the self-reliance that continues to inform his curating and art today. In Denver, Jacobs said, "People threw Big Gulps at me for skating down the street with my head shaved." As he found out, the hostility came with a punk tradition. Jacobs felt inspired by both. Wax Trax Records, a well-known record store that's still open in Denver, was crucial to Jacobs' musical education. The store's co-owners had established the record label Local Anesthetic (an eponymous compilation remains in print) to document early post-punk in Colorado, which Jacobs talked about with as much zeal as the bands that were active when he lived there. In high school, he booked countless shows, including the first Denver appearance by Fugazi, even though it required finding a new venue every time. "We could book shows because most people who owned a bar or ran a hall didn't really know what punk was, but they hated it once the show was happening," he said. "We had a big skinhead problem, which didn't help, but we'd have to drive around after every show looking for somewhere to have the next." At the time, Jacobs also founded Skate Edge. Cut-and-pasted together by hand, crudely Xeroxed, and distributed through a pre-internet network of self-publishing proponents, Jacobs found an audience around the world through word-of-mouth, pen pals, and the postal service. Beyond skateboarding, the zine also showcased Jacobs' identification with straightedge, a punk subset that featured likeminded bands and labels advocating sober lifestyles. Ironically, Jacobs' family worried that the steady arrival of packages had something to do with drug dealing. But Skate Edge's assimilation into the straightedge community ultimately alienated Jacobs. "When I heard about straightedge, it was just convenient. I hadn't ever done drugs or drank, and still don't." Eventually, though, he said "I got weirded out by how uniform it was. People's letters even had the same kind of graffiti-inspired handwriting." After graduating from high school, Jacobs moved back to Southern California and roamed between Los Angeles and San Diego. He tried art school, but found the disciplined institutional approach counter-productive. After all, his visual art had already graced countless zines, fliers, and albums. Instead, to formalize his practice, Jacobs leaned on habits honed in the punk scene. "I thought, in order to be an artist, you have to have an art show," he said. So Jacobs started soliciting galleries in person in order to find prospective venues to show his work. "I used the same idea to curate art shows as punk shows — find a venue, choose the artists, make a flier, believe you can do it yourself, and do it." He abandoned the Skate Edge moniker in favor of Move, a flexible tag meant to encompass anything that moved him, and applied it to both zines and the art shows he continues to curate. 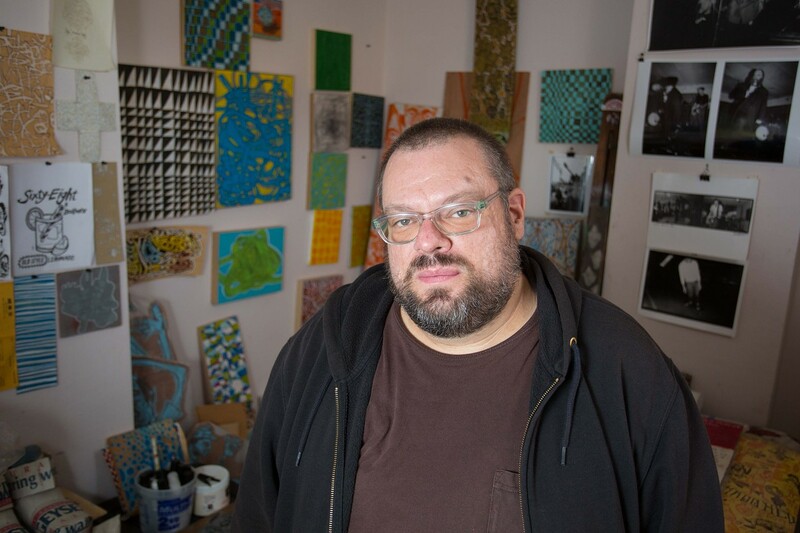 Artists featured in early Move shows include the influential local street artist Barry McGee and his late wife Margaret Kilgallen. One of the notable Move exhibits was There Is Xerox on the Insides of Your Eyelids, which featured art from more than a dozen skate zines, most of which Jacobs culled from his personal collection. Skate Edge figured prominently, along with work by Mofo, staff photographer at the San Francisco-based Thrasher magazine, and well-known skate documentarian. The exhibit opened locally at Needles & Pens in 2007, and eventually traveled to New York, London, and finally Japan for the Tokyo Art Book Fair. Jacobs is currently adapting it for a coffee table book. Presenting skateboarding and punk in gallery contexts tends to undermine what made such things vibrant to begin with: transgression, countercultural vigor, art-world autonomy, and so on. Jacobs counters the effect by occupying a liminal space between the art establishment, commerce, and homespun collaborations. For every design gig he takes on for Vans, Jacobs indulges a money-losing self-publishing endeavor. While There Is Xerox on the Insides of Your Eyelids will become a coffee table book, it also sells for $5 at local record stores as a photocopied zine — and he'd prefer to just trade. Rather than enshrine punk's past at the expense of its present, Jacobs collects every flier he sees for local punk shows today. When Needles & Pens celebrated its tenth anniversary last year, it published a zine full of artist testimonials and reflections on self-publishing. Jacobs' contribution resonated the most because it's no less true now than when the underground discovered photocopying. As he wrote, "Zines are the stories of people in their own words."